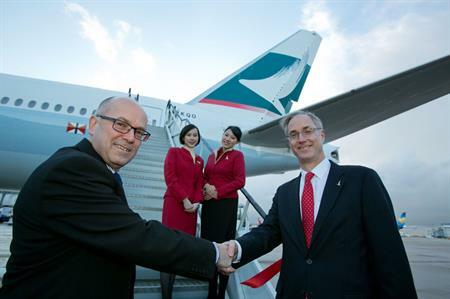 Cathay Pacific yesterday (8 December) launched a four-times-weekly service from Manchester to Hong Kong, the first flight from the north of England to China. Outbound flights will depart from Manchester Airport every Monday, Tuesday, Thursday and Saturday at 12.00 and will arrive in Hong Kong at 07.55 every Tuesday, Wednesday, Friday and Sunday. Inbound flights will arrive in Manchester from Hong Kong at 06.20 every Monday, Tuesday, Thursday and Saturday. The new route is the only UK service outside London to offer a non-stop direct route to China and is expected to stimulate economic growth in the North West and meet the increasing demand for air travel to and from the Asia Pacific region. Cathay Pacific flies to 190 destinations globally via Hong Kong International Airport, including 22 destinations within mainland China. Manchester Airport is already the UK's third-largest, with more than 21.8 millions passengers per year, and a proposed £800m expansion – Airport City Manchester – is set to increase its status further as an international hub.